The main pipe which is usually connected to the sink, makes the transport of fluid through the pipe ring and has a diameter larger than the diameter of the pipe network. The”drip irrigation” system is commonly used for horizontal surfaces but in our case it is used for vertical surfaces. The main elements that make up the “drip irrigation” system are pipes, connectors, fluid flow holes, pressure regulators. In this case, the “drip irrigation” system will be connected to the pump which is programmedvia the PLC microcontroller and as a result we have automated irrigation. To have maximum performance, for air purification the the irrigation is done automatically with the system (drip irrigation) according to the needs of the plants. According to the calculations we have shown, a single product “TE Pema” is equivalent to about 70 small trees. The plants are used in maximum, as well as air circulation increases due to the structure and plant placement. Considering that the same plants if they were on the flat surface, the same effect would not be achieved. The product TE Pema collects water from the precipitation, which it filters and with that water is filled the reservoir, from the filled tank, the automatic pump sends the water to the plants. Also, the tank is manually filled when there is no rainfall. Awareness about air pollution and the consequences of air pollution, is our success we are aiming for. For this we need help and cooperation. 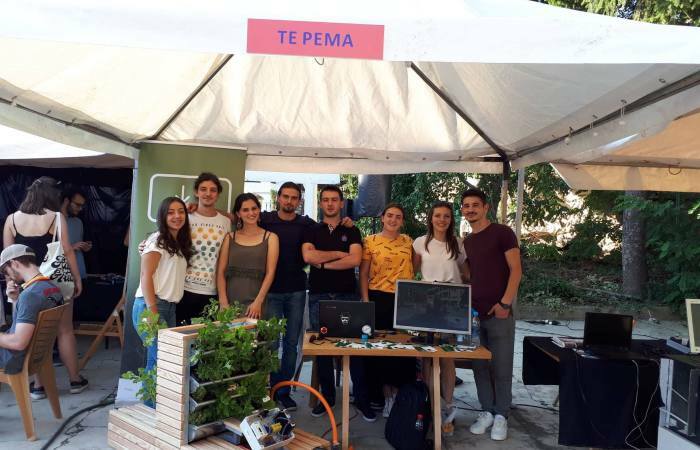 The first prototype TE Pema was initially located in the technical faculty, then the municipality provided us with space in the Zahir Pajaziti square, where it is currently located. TE Pema is functioning very well and the municipality of Prishtina has decided to build also other TE Pema in different places of the Prishtina. Working with IPKO Foundation has been very close cooperation and with very good results, IPKO Foundation has also made possible our participation in DOKUTECH as part of the DIY Fair. Where we presented the mini model mini TE Pema. Personally and on behalf of the group, I thank the staff of the IPKO foundation and hope to have other collaborations as well.